Cooling tower efficiency relies upon maintaining a clean and debris free sump. If you keep it clean you reduce the risk of the biological sludge creating a nutrient source for legionella bacteria. RABScreen client, Tower Systems, were tasked with solving the problem of airborne debris on the AT8-99D & 1 No AT 8-912 Open Circuit Induced Draft Cooling Towers manufactured by Evapco. These towers provided cooling for plastic injection moulding machines. Chris Stanton, Contracts Engineer for Tower Systems contacted Richard Betts of RABScreen and we selected two layers of BHC media for this particular problem. Manufactured with a vinyl border, a self-adhesive Velcro® strip was sewn around the perimeter. This allowed the end user to easily fit the new external filters over the air intake louvres of the cooling towers. 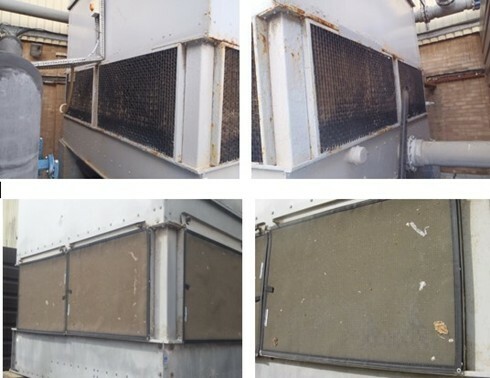 Designed to stop airborne debris from fouling the equipment by stopping it at its point of entry - the air inlet face - RABScreen filter screens will catch dust, pollen, seeds, insects, birds, leaves, grass, construction dust or laundry lint. The use of filter screen protection will significantly reduce maintenance time, eliminating time consuming & messy chemical cleanings. After two weeks it was very easy to identify just how well this unique product was working. And the benefit to the customer? Less debris in the sump leading to reduced cleaning. Improved water quality reducing the need for disinfection. 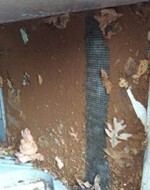 Filters just wash, brush or vacuum clean and do not need specialist labour.